On Friday, January 29th, our pal Candice Sexton will be in town to share the bead crochet fun with us. She’ll be teaching a class suitable for beginners, and will be doing a book signing later in the day! Details below! Take the mystery and frustration out of crocheting with beads in this fun class with the wonderful Candice Sexton! You’ll create a great bracelet, learn to include a focal bead if you choose, and master beginning and ending like a pro. We’ll have you string up your beads easily before class so that class time is all about crochet! Candice is a fabulous instructor! She is the author of Bead Crochet Basics and happens to be the designer of the cover project in the February issue of Bead & Button magazine. Don’t miss the chance to learn from this talented and fun artist. 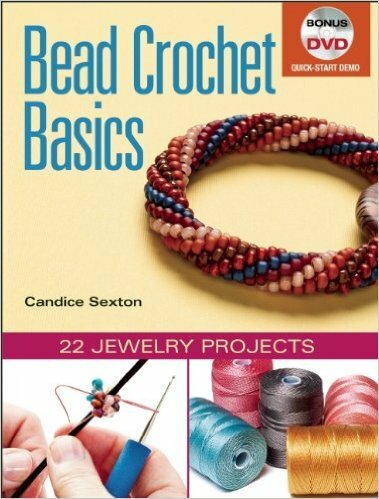 Candice Sexton, author of Bead Crochet Basics will be at Funky Hannah’s from 5-7pm on Friday January 29th for a book signing event! Come and enjoy refreshments and pick up a copy of this great resource! Chat about all things bead crochet and see samples of projects in the book!